Consumer confidence matched this positive performance, as the University of Michigan Consumer Sentiment measurement beat expectations in January and reached the highest levels since 2004.3http://www.cnbc.com/2017/01/27/consumer-sentiment-index-hits-985-in-january-vs-estimate-of-981.html However, one piece of data we received last week gave a less rosy view of the economy: initial GDP reports. Many aspects of our economy showed solid growth in the fourth quarter. Household purchases grew, business-equipment spending advanced for the first time in over a year, and inventory accumulation increased.5https://www.bloomberg.com/news/articles/2017-01-27/u-s-economic-momentum-faces-wild-card-in-trump-s-trade-policy Net exports, however, pulled growth down by 1.7%—the biggest drag since 2010—as we saw a jump in imports coupled with a decline in exports.6https://www.bloomberg.com/news/articles/2017-01-27/u-s-economic-momentum-faces-wild-card-in-trump-s-trade-policy Working to increase U.S. exports is important because it can help strengthen America’s economy, support additional jobs, and promote sustainable growth. Between lagging GDP and the Dow reaching historic levels, this week showed us a range of perspectives on where the economy now stands. The markets will always have uncertainty and unanswered questions, and—as always—we must stay focused on the fundamentals that drive performance in the long term. For now, we will continue monitoring policy developments and the trade deficit to determine how they may impact economic growth in 2017 and beyond. We will also pay close attention to the economic data that gives the deep insight upon which we build our strategies for pursuing your goals. A warm dish that’s full of flavor! Place sweet potatoes, lentils, apricots, onion, chili paste, and broth in a large pot. Bring pot to a boil over high heat. Reduce to low heat once boiling and cover with lid. Simmer until lentils are breaking down, about 25 minutes. Uncover soup and let sit for 10 minutes. Puree soup in blender until smooth, in batches if needed. Pour pureed soup into bowls. 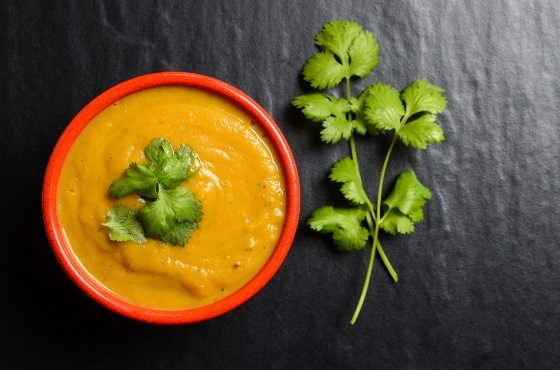 Top soup with cilantro and pomegranate juice or seeds, if using. If you’re still filing taxes by paper, you may be creating unnecessary work for yourself. The IRS accepts electronically filed tax returns, which is the fastest and safest way to file. Here are some top reasons why the IRS suggests you e-file your tax return. Safe and Secure: IRS e-file has strict security guidelines and uses modern encryption technology for protecting returns filed online. The IRS has safely and securely processed over 1 billion returns online. The IRS recently put new safeguards in place to protect filers. Faster Refunds: When filing online, e-file usually helps prevent mistakes and enables you to receive your refund more quickly. You can streamline this process by combining e-file with a direct deposit into your bank account, which usually pays refunds in less than 21 days. Healthcare Coverage Reporting: IRS e-file will help you include reporting about your healthcare coverage. The software will walk you through each line that relates to the Affordable Care Act. Payment Options: When you file online, IRS Direct Pay allows you to pay taxes you owe electronically from your bank account. You can also pay by credit or debit card. Visit gov/payments for further details. Hitting solid iron shots that stick close to the hole requires an ability to tear off the turf without compromising your stance or losing control of your swing. Master this skill and your score is bound to improve. These three tips can help you rip your irons with the correct stance and swing every time. Keep your footing. Firmly planting your feet is important for not spinning out the shot. To do so, when swinging down, you need to ground your back foot until after you’ve connected with the ball. Shift forward. Does “stay behind the ball” sound familiar to you? Well, here, you actually need to shift your weight forward in the downswing to avoid hitting behind the ball or thinning it on the upswing. Roll your front foot toward the target so your body shifts in the same direction. Remember, you need to keep your back foot grounded during this move. Extend the club. Fully extending your dominant arm is crucial. Rather than losing the extension before you hit the ball—and risking poor, inaccurate contact—you need to maintain your swing arc through impact. When practicing, reach toward the green with your club and see how much farther and straighter your iron shots go. Don’t overtrain when exercising: Remember “No pain, no gain”? Well, this adage just is not true. Instead of training for pain, you need to build up your strength methodically and efficiently. Practice proper lifting techniques: Don’t let shoveling snow or lifting boxes throw your back out. Always remember to bend with the knees and lift from your legs when picking up heavy items. Ask for help when you feel something is heavier than you should carry on your own. Sit less: Sitting compresses the vertebrae and can create a host of complications. You should try to not sit for consecutive periods longer than one hour. Be sure to stretch a different part of your body for one minute every hour. Elevators may take us where we want to go quickly, but they usually rely on electricity to operate. This means that every single time you take the elevator, you are more than likely contributing to actions that can harm the environment. To operate electrically, the elevator may require uranium- or fossil-fuel mining, nuclear- or fossil-fuel plant operation, and greenhouse gas emissions. To minimize your pollution contributions, you can swap the elevator for stairs. In the process, you’ll also contribute to improving your health, since going up and down stairs requires physical effort. While elevator rides are usually quicker, this simple change can lessen your environmental impact and whip your body into shape (meaning you might not need the stair-climbing machine at the gym anymore! ).